Tourism and Corinella Local Business ! CORINELLA - VICTORIA'S BEST KEPT SECRET ! 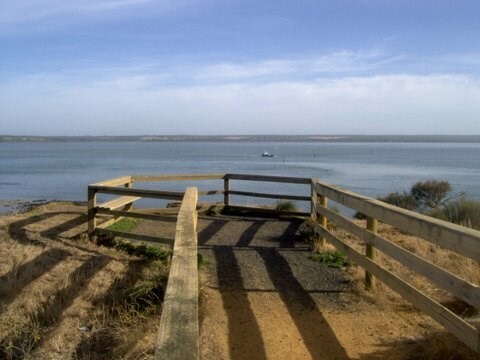 Discover this beautiful seaside town in Country Victoria. agree when you visit this very special Victorian town ! 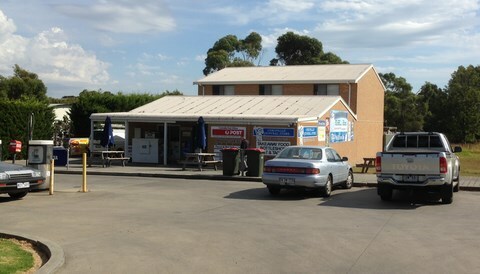 Corinella is approximately a 90 minute drive from Melbourne or about 40 minutes south from Cranbourne. A pleasant and easy drive along the Sth Gippsland highway, then continuing along the dual laned Bass highway toward Phillip Island will bring you to a right hand turn Into Corinella road. This is a turn that many travelers have never even noticed as they drive onward to Phillip Island or actually even realized what a jewel lay at the end of that road, Or that they have just driven past and missed one of the prettiest seaside towns in Victoria! This is why Corinella has remained a Hidden Treasure and Is Victoria's Best Kept Secret! Corinella - an idyllic seaside town In Victoria's Gippsland region is a large rural district beginning on the Bass Highway and reaching around the coast line from Queens Ferry road, completely surrounding the small township of Tenby Point, and then stretching many kilometers of rural farmland down to Coronet Bay, also out southward to King road Bass, but finally culminating in the small township zoned area on the Corinella Peninsula. This is where the Historic 1826 settled town of Corinella first began and the birthplace of Victoria. If you have ever wanted to live next to the sea in a beautiful natural setting or wanted to take an early morning stroll along serene seaside walking tracks that go for miles and miles then slip your boat into calm clean ocean fed waters and just relax while you catch a snapper or a brace of whiting for breakfast and do all this just seconds from your front door and still only be about an hour and a half's drive from Melbourne, then the Historic Town of Corinella is for you! Corinella is truly Victoria's Best Kept Secret, Come down and have a look and see for yourself, the Coastal views are amazing, the township has been overlooked for so many years as people just drive by on their way to Phillip Island looking for a coastal haven and don't realize they have just driven past the jewel of the Western Port region. 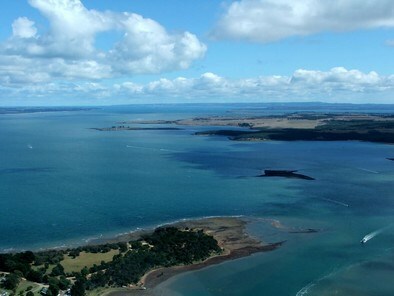 Corinella enjoys a warmer average temperature due to being surrounded on three sides by the waters of Western Port bay, the warmer water temperature helps to keep the winter frosts to a minimum and keeps the climate in Corinella milder than the ocean facing Phillip Island. A lovely blend of rural grazing and farming land surrounds the Corinella Peninsula with a broad range of agricultural production, Including prestigious thoroughbred racing horse farms, beef and dairy cattle, red deer farming, flower and herb growers, winery viticulture and many more, all prospering in this ideal seaside climate. When you arrive in Corinella you first notice the calming holiday atmosphere, and you also notice that the town has a very spacious feel with nice wide, well treed streets, and homes that are well proportioned and not overly crowded together, and mostly are built along the holiday theme style typical of a relaxed holiday coastal town. The Corinella Peninsula is blessed with panoramic picturesque views of the sea and Islands and has ideal access to the bay for most type's of boating craft. With a stairway at the end of O'Connor road providing easy access to this sandy beach you can easily take a relaxing swim here or enjoy a walk along the Corinella beach to Norsemens road or continue on to Coronet Bay beach or return along the defined Corinella walking track among coastal banksia and she oaks all the while being treated to beautiful blue wrens flitting about this serene seaside bush track setting and you will also be treated to many water bird species on display in the small freshwater lake here on the walking track while you take time out at the picnic tables, set up alongside for your enjoyment of the area. 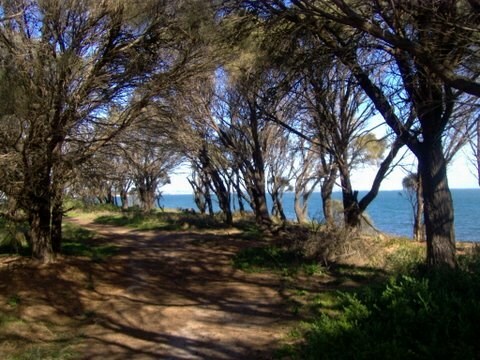 This walking track will bring you back to the O'Connor road car park or you can continue along the walking track, walking atop the cliffs around to the Settlement Point observation platform and then continue on to the jetty / rotunda picnic area. Walking in the other direction from O'Connor road along the beach (toward Settlement Point) will take you to tidal rock pools, sea shells and imposing cliff faces! 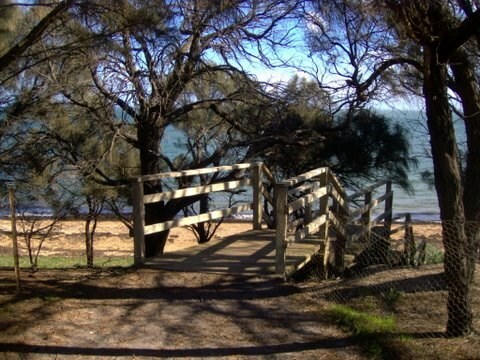 You can rejoin the walking track at another stairway at the end of Beach street or if the tide is out you can actually walk (carefully) along the tidal rock flats right around to Settlement Point to arrive at the car park at Corinella jetty / rotunda picnic area. Be sure to anticipate the incoming tide though as at high tide, navigating completely around in this direction on the beach is not possible. There is plenty of car parking available at O'Connor road, but please remember to take your food wrappers and bottles home as no bins are provided at this scenic car park area. Corinella walking tracks are well maintained by Corinella foreshore committee of management, who do allow walkers to bring along their dogs on leashes, but remind all that it is Necessary to pick up after your pets for the health and comfort of others. Above: Looking Down Peters Street opposite the caravan park at the Corinella Jetty ! Corinella caravan park sits right on the hill top overlooking the pier and jetties and has a lovely view of the bay and French Island, also the caravan park is a starting point for the walking track trails that lead you to 'The Lookout ' at nearby 'Settlement Point' where you will be amazed at the incredible panoramic view from the viewing platform, of the waters and of French Island, then look across to the bridge at San Remo and Phillip Island. From here to you will be able to see many leisure craft moving about and also at anchor enjoying a days fishing, then continue along as the trails gently meander completely around all of Corinella and even further afield to the nearby town of Coronet Bay or in the other direction toward Tenby Point. Walking in this direction you will often see many of the black swan colony, long time residents of Corinella, also of an early morning or at dusk you may see wallabies browsing along these trails. fresh water is available and new shower/toilet facilities are now also open. Corinella caravan park is managed and maintained by the Corinella foreshore committee of management, who do an excellent job of maintaining and keeping the park & surrounds very clean and modern, and always well presented! Above the Corinella launching ramp and jetty area, on The Esplanade is the beautiful foreshore park reserve with a rotunda for shade and free electric BBQ's provided. There are many picnic tables and comfortable bench seats located in selected locations for excellent viewing of the comings and goings of the boats in the water and at the launching ramp and of adults and children enjoying fishing from the famous Corinella jetty. This is an ideal picnic spot for all the family and why not cook up your fresh mornings catch for lunch on the BBQ's! A clean modern toilet facility is placed opposite for easy access. French Island - Corinella ferry / vehicle barge operates from Corinella foreshore just to the left of Corinella jetty for passages across the bay with or without your car, to visit French Island for day trips, tours, exploring, or to visit for lunch or a stay at the historic McLeod prison on French Island, now converted into an eco tourist farm and B & B. 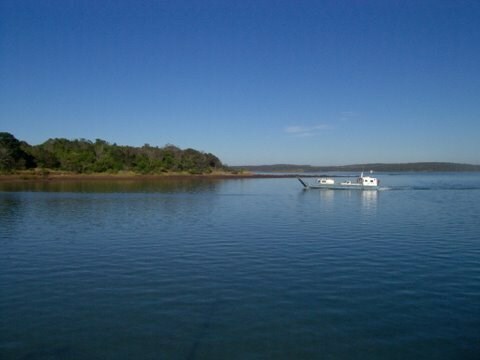 Also you could stay at beautiful Elizabeth Island eco retreat to enjoy a well earned rest, just 1 klm off Corinella's Settlement Point, the ferry will take you and pick you up at a time that suits your requirements. Ferry booking contact details, can be found on the services page on this site, click on the link below. Corinella is one of the first towns settled in the state of Victoria. The first Government House in Victoria was built here in Corinella. The first military / Government road in Victoria was here in Corinella. Corinella's historic significance to Australia's settled history is very important and is not widely known or advertised, however Corinella was actually the site of the first Government House in Victoria and was a town at federation. later founded in 1826 and originally was first named 'Red Point' Then later 'Settlement Point' until the Settlement took on it's current name Corinella. The name Corinella is thought to have been taken after it was apparently noticed the Aboriginal People calling the area around the settlement 'Coreen' or 'Koorinella' These are Aboriginal words or names which mean 'Running Water' or the latter 'Place Where Kangaroo Drinks' these apparently were in reference to the mobs of kangaroos that were always found gathering in the settlement area. The Victorian State Library suggests Corinella means "Home of the Kangaroo"
(all are unsubstantiated) Some weight to all these reasoning's perhaps may be taken from the very reason the original settlement itself was founded here, A reliable source of clean drinking water from a fresh water stream flowing through Corinella down to the bay. Another thought is that the Aboriginal name may refer to the very fast flowing tidal waters that run between Corinella's Settlement Point and Pelican Island, During the run in or run out tide the waters here can reach 9 knots and perhaps even more if a wind is behind it, Running Water Indeed ! A small stone and convict brick cairn at the end of Jamieson Street commemorates the first settlement established in Corinella from 12 December 1826 by a troop of soldiers along with convicts under the command of Captain Samuel Wright. A later expedition to the settlement was led by Paul Edmund de Strzelecki in 1840. A memorial at the caravan park camping area commemorates the arrival of this expedition party to the Settlement on 2nd of May 1840. 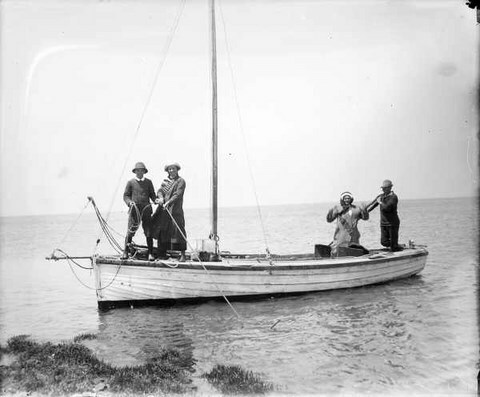 Further research into the history of Corinella is needed and more information from the British Govt archives is required to establish exact dates and events, and of other possibly earlier exploration. 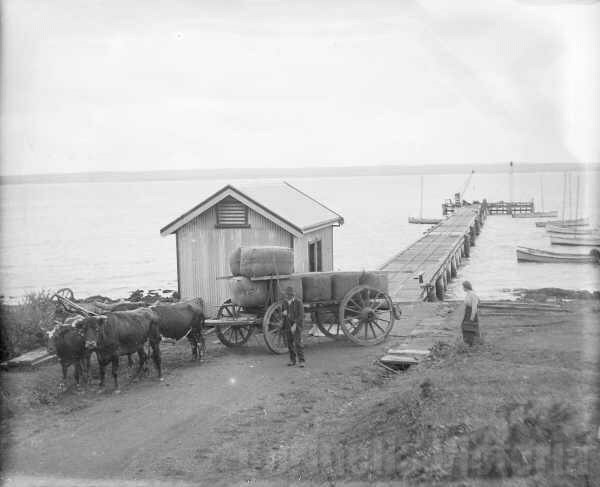 This historic fishing village has been the home of many professional fisher family's and still today Corinella holds the claim of Victoria's best and most productive fishing grounds. You may notice in Corinella many homes are equipped with their own fishing trailer boat, this is natural! because when you live in Corinella you too will want to explore the magical waterways, have boating picnics and of course catch your very own fresh seafood from the ocean fed waters surrounding Corinella in Western Port bay. 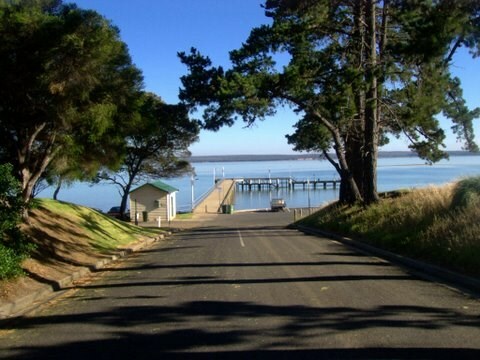 Corinella has a dual lane concrete boat ramp and is well catered with full jetties along each side for your comfort and safety, fresh water is available and fish cleaning facilities are provided and the jetties launching ramp and car park are flood lit at night for visibility. The deep water channel passing right up to both the Corinella jetty and Importantly to the launching ramp means possible all tide access to the waters of Corinella for most boats to around 8 meters. Ample car and trailer parking for even the very busy seasons, means you will not have to walk far after parking your vehicle so you can just get on with fishing! Corinella boat launching ramp is controlled by a friendly ramp master during the busy seasons, So orderly use of the launching ramp is assured, also assistance may be obtained for those who may need a hand to launch or retrieve their vessel. A daily launching pass can be purchased at the ramp masters office alongside the ramp, or you may choose to purchase a yearly pass to use these great facilities. 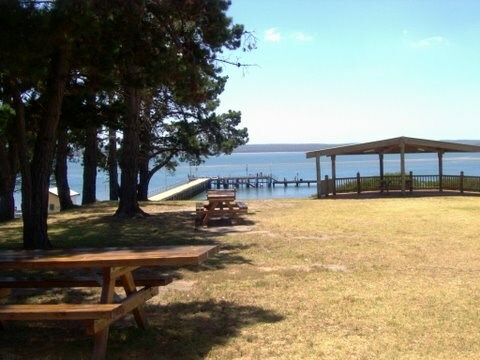 Free electric BBQ facilities and picnic tables are provide in the reserve above the ramp along with a shaded rotunda lookout area, clean modern public toilet facilities are opposite at the caravan park entrance. Boat hire is also available at the boat ramp. Corinella has excellent mooring grounds, sheltered from the southerly gales, for your fishing Boat, yacht or motor cruiser, there are many boats on these swing moorings and new moorings are still available in the channel for your own yacht or motor cruiser. Contact PARKS VICTORIA San Remo office Phone 13 1963 for more Information / mooring contractors available to Install your own mooring at Corinella! Saved ! Corinella Jetty ! In Corinella's Recent History a Community effort was made to Save the Corinella Jetty ! Parks Victoria had made known that due to a lack of funds, the end platform of the Historic Corinella Jetty was to be Demolished and Not Replaced ! The Corinella Community was not impressed ! and all went about organizing a fundraising campaign to have the jetty landing Rebuilt ! Have a look at a short video below that tells a little of our story ! 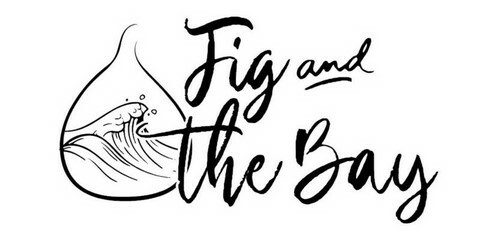 Fig and The Bay is a Brand New Cafe that has Opened in the Heritage Bay Land estate, Corinella !!! Come On Down And Say Hello ! Childrens Centre NOW OPEN ! Ice, Petrol & Auto/Marine oils. The Corinella General Store ! * Local Grown Produce ! The Corinella History Trail featuring storyboards that tell a story of times past at Corinella ! Click on the map above to take you there ! Lots and Lots of Pre Loved Clothes, Children's Toys, House Hold Goods & Bric a Brac ! Drop In and Find a Bargain !